By now, you’ve all heard about Facebook EdgeRank. For those who haven’t, it is Facebook’s algorithm to determine what status updates are displayed in each user’s newsfeed. The user’s engagement level with the person, page, or group sending the update. The type of update the person, page, or group is posting. Status update types rank in order of photo, text, video, and links when it comes to overall engagement (although video updates get more shares than text updates) according to this study by Dan Zarrella. The age of the status update. The older it gets, the less likely it is to show up in the newsfeed unless it has a ton of social engagement. If you’re tired of not seeing updates in your newsfeed from your favorite people, pages, or groups, here’s what you need to do. Get Notifications – This will show you a notification in the upper left side of your Facebook screen that your friend has posted a status update. Show in News Feed – This will ensure more of your friend’s updates are shown in your News Feed, but you could still easily miss them depending on number of friends, subscriptions, and pages you follow. Close Friends – This adds your friend to a list that automatically enables Get Notifications and Show in News Feed. By doing this, it will help friends not have to succumb to paying for Facebook advertising which is now available to personal profiles as well as business pages. 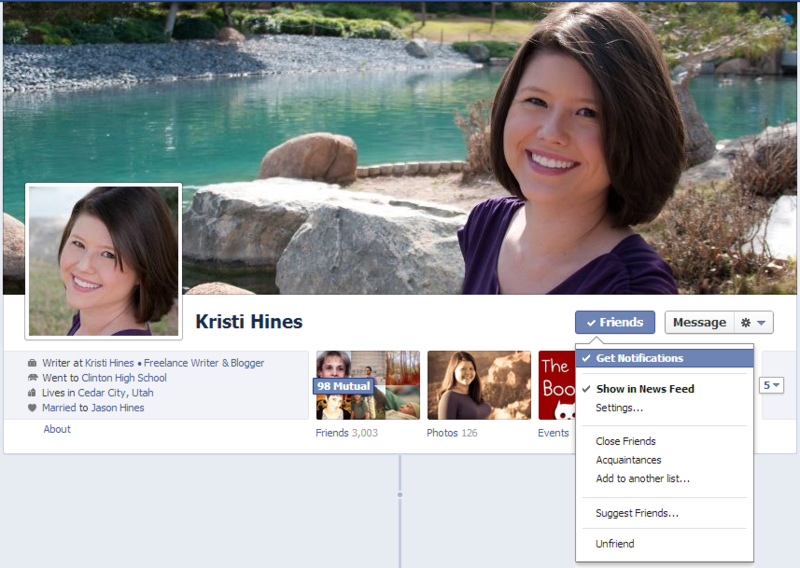 If we’re friends on Facebook, be sure to try this now with my profile. When it comes to the people you subscribe to, your only option to ensure you do not miss their updates is to Get Notifications. You can also do the Add to Interest Lists if you are really dedicated to the lists you are subscribed to, but it doesn’t mean that you’ll see your subscriptions’ updates in your newsfeed outside of those lists. If you’re subscribed to me on Facebook, be sure to try this now with my profile. Get Notifications – This will show you a notification in the upper left side of your Facebook screen that the page you like has posted a status update. Show in News Feed – This will ensure more of the page’s updates are shown in your News Feed, but you could still easily miss them depending on number of friends, subscriptions, and pages you follow. By enabling these features for pages you like, you save small business owners from having to spend a lot on Facebook advertising. Think of it as helping businesses out a little by giving them the attention they deserve to be getting naturally from Facebook. 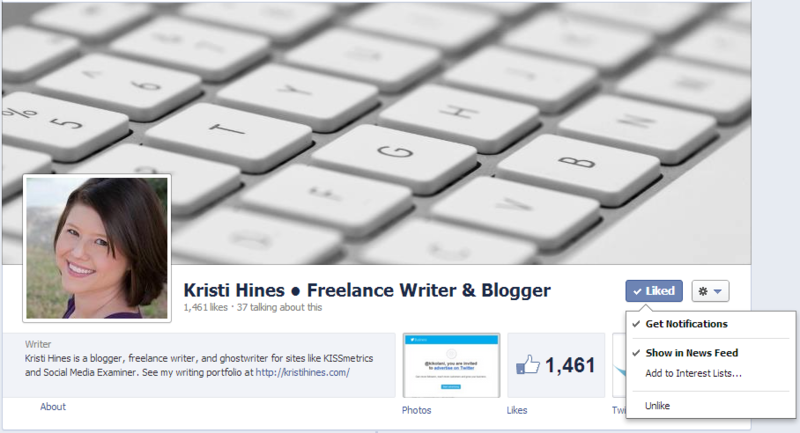 If you’re a fan of my page on Facebook, be sure to try this now with my page. Get Notifications for All Posts – This will show you a notification in the upper left side of your Facebook screen that someone in the group you belong to has posted a status update. Get Notifications for Friends’ Posts – This will show you a notification in the upper left side of your Facebook screen that one of your friends has posted a status update in the group you belong to. Alternatively, if you would like to participate in a group but stop getting notifications about all of their updates, you can find this setting and turn off notifications for all posts. So how do you beat Facebook EdgeRank to ensure that more of your friends, subscribers, fans, and group members get your updates? Outside of posting more updates in an attempt to drive more engagement or paying for Facebook advertising, you can educate people on how to do the above things. If you don’t have a good screenshot application, try Jing for Windows or Mac – it’s free and it’s what I used to grab the above screenshots. Grab screenshots for your profile, page, or group similar to the ones I have above and post similar directions to your blog, profile, page, or group. For updates on Facebook (with exception to groups) this is the perfect thing to advertise – the one advertisement (Promoted Posts for pages and profiles or Sponsored Stories for pages) could go a long way in helping you get more engagement.